Abdelwahab Meddeb crosses boundaries in unusual and important ways. Born in Tunis, he is now a French national. In his academic and literary work, he is concerned with the roots and history of Islam and with crossings, like his own, between Islam and Europe. He is an author of extraordinarily beautiful French; this is the first book to represent this lyrical aspect of his work in English translation. White Traverses is a poetic memoir about growing up in Tunisia and the contrasts between Islamic and European influences. In it, the intense colors and blinding whites of the Maghreb interweave with the rich traditions of French poetic discourse. In Africa as in Europe, white designates purity. Yet the complex Mediterranean streams of culture that flow together in Tunis problematize this myth. Meddeb captures their white refractions in vignettes that teach us the truth of the coincidence of contraries, of how the impure lodges in the pure. 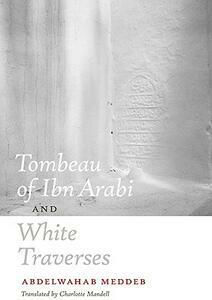 Tombeau of Ibn Arabi is a series of prose poems that draw their inspiration from the great Sufi poet of mediaeval Andalusia, Ibn Arabi, whose fervent love poetry both scandalized and transformed Islamic culture, and from Dante, who learned from Ibn Arabi a poetry of sensual love as initiation into spiritual experience. It seeks to show how a text written in the present day can maintain a link with the great dead . Ibn Arabi and Dante are two symbolic figures confirming the author's twofold spiritual genealogy--Arabic and European.